Pilgrim’s Bounty is here and we have the in – game guide for you to complete your Achievements, Dailies and collect new rewards! You will find the guide in the events sections. Pilgrim’s Bounty is here and it’s time to reflect on your journeys across Azeroth, share plentiful food, and exchange stories with friends. Throughout this holiday, you can partake in feasts near major towns by sitting at a bountiful table and enjoying the foods you find there. There appear to be no major updates in 2018. The main update in 2017 is that holiday items can be transmogged during Pilgrim’s Bounty. In addition, the The Spirit of Sharing buff is great with Celebration Package. 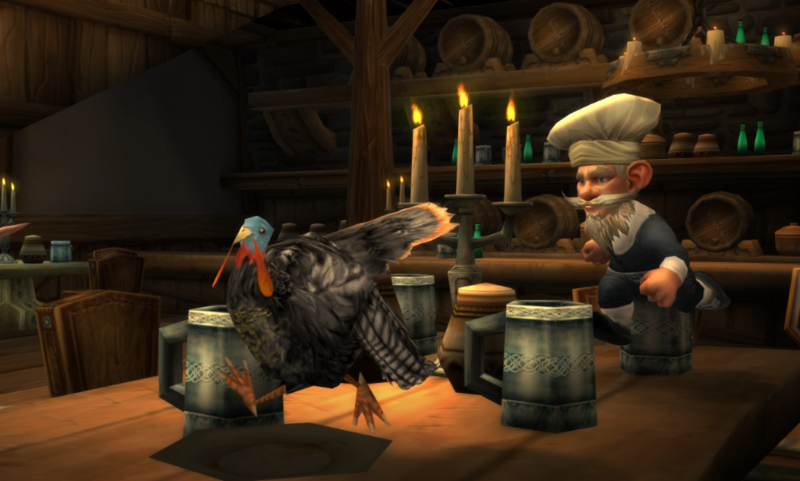 The last updates were in 2014: Silver-Plated Turkey Shooter, Fine Pilgrim’s Hat, Frightened Bush Chicken which can be found in the daily quest reward Pilgrim’s Bounty. Due to its focus on food, this holiday is especially well-known for being a quick and easy way to level up cooking, although that has diminished in recent years by alternative ways to level cooking. 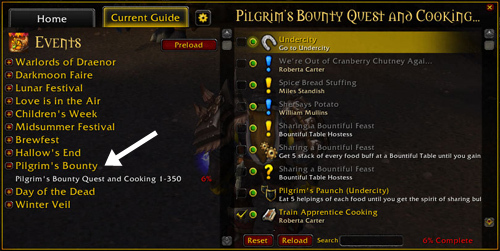 Learn about easy ways to level cooking in Draenor here. This holiday lasts from November 19 to November 26.